Separated from his wife by a transparent barrier in a visiting room at the immigration detention center in Minato Ward, Tokyo, Colak touched it with his left hand to feel the warmth of her right hand. It was the closest they could get during their 30-minute visitation. 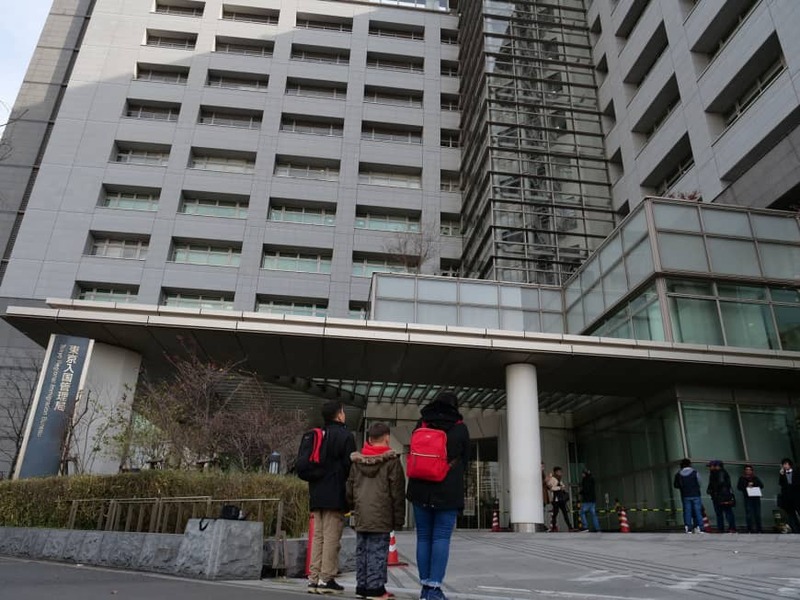 A 39-year-old Kurdish asylum-seeker who revealed only his last name for safety reasons, Colak has been detained in the Tokyo Regional Immigration Bureau since Jan. 11 of last year. “This is just bullying. I did not do anything wrong. My kids are waiting for me to come back,” Colak said in an interview with The Japan Times in mid-December. 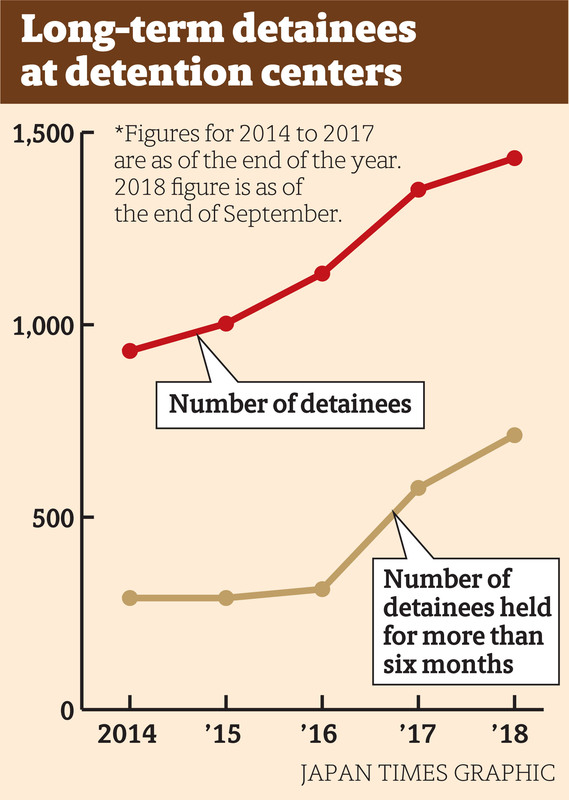 As of last Sept. 30, there were 713 foreign nationals, including Colak, being held for more than six months in Japan’s detention centers — the period of time that the government says makes them “long-term detainees,” according to the Justice Ministry. The detainees, who resist their deportation orders for various reasons, including the possibility of persecution back home, are stuck and have scant prospects of getting out. Critics point out that the lengthy detention affects their physical and mental well-being. The percentage of long-term detainees among all people being held in immigration centers has increased over the past four years — 49 percent at the end of last September (713 out of 1,433) compared with 31 percent at the end of 2014 (209 out of 932). One of the main reasons is the government’s tighter immigration controls to achieve a “safe and secure” Japan when Tokyo hosts the Olympic and Paralympic Games in 2020. “The pressing issue for the Justice Ministry is to reduce the number of foreigners who are causing anxiety among the public such as illegal overstayers, those who have acquired visas with forged documents and foreign detainees who resist deportation orders,” the Justice Ministry’s Immigration Bureau said in a 2016 document addressed to the chiefs of detention centers and local immigration bureaus across the nation. In the past, detainees of this sort were granted provisional release to avoid long-term detention, allowing them to be released but remaining under supervision. However, the Justice Ministry has been imposing a stricter policy on issuing two-month renewals for provisional releases, and is now revoking the status of those the ministry deems no longer qualify. Colak is among the detainees whose request for a provisional release has been turned down. He was labeled a criminal in Turkey after one of his relatives brought back photographs of him and his friends holding flags of the Kurdistan Workers’ Party during a spring festival in Japan, according to Takeshi Ohashi, a lawyer who has been supporting refugees for more than two decades. His friend was detained at the airport when he returned to Turkey and was sentenced to three years and nine months in prison. Ohashi said that because of the risk of persecution, Colak should be granted asylum. Since arriving in Japan in 2004, he has filed for refugee status four times. His short-term visa expired during the application process, and he was living here under the provisional release program along with his wife and three children, who have also applied for refugee status. The family was split apart a year ago when Colak’s provisional release was revoked without explanation. He was immediately taken into custody by Immigration Bureau officials. According to the ministry, provisional releases are only issued when overstayers are seriously ill or if they meet other conditions that obviate the need to be held in a detention center. Any illegal overstayer who has been handed a deportation order can be detained, and it is not unusual for asylum-seekers with deportation orders to be detained if they repeatedly file for refugee status using the same reason and without providing additional evidence, which often is hard to obtain. 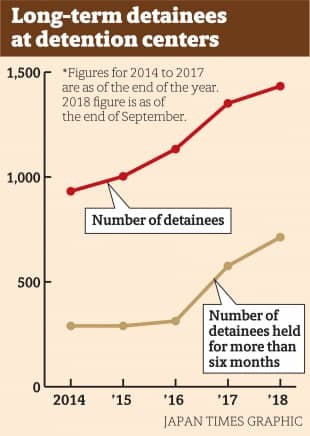 Japan’s detention policy has drawn international criticism. A report published in 2013 by the United Nations Committee Against Torture stated that Japan should “ensure that the detention of asylum-seekers is only used as a last resort, and when necessary, for as short a period as possible, and introduce a maximum period of detention pending deportation.” The report also pointed out Japan’s lack of independent review of detention decisions. Despite such criticism, the Immigration Bureau has maintained its stance. The head of the bureau, Masaki Wada, issued an internal document dated Feb. 28, 2018, stating that barring extreme illness, those who do not qualify for provisional release should be detained until they agree to be deported. Japan, as a signatory to the U.N. Refugee Convention, is not allowed to repatriate refugees to their home countries and the deportation process is suspended when a detainee rejects repatriation. Often, it comes down to who gives in first — the detainees or the immigration authorities. The ministry believes that a large portion of people requesting asylum are unskilled laborers from Asia trying to take advantage of the refugee system, which grants work permits to all asylum-seekers six months after applying for refugee status. The ministry, therefore, introduced a stricter screening system last January to weed out the people who came to Japan to work rather than to flee persecution. Those who file applications based on reasons the ministry does not consider valid under the 1951 Convention Relating to the Status of Refugees can face deportation. Living in a room with eight other people for more than a year has taken a toll on Colak, as he now claims he has developed asthma and sometimes suffers from chest pains. “It took almost two months to see a doctor after seeking medical attention,” he said. “The doctor didn’t examine me physically” but only asked questions about his condition. 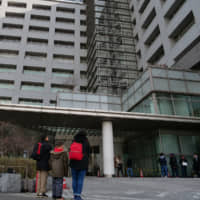 Tom Takasaki, an official at the Tokyo Regional Immigration Bureau, said the bureau cannot comment on individual cases, but on average it takes four days to two weeks for a detainee to see a doctor. He said doctors conduct medical examinations from Monday to Friday and that a clinical psychotherapist comes in once a week. Colak lamented that the toughest part of being detained is not knowing when he will be released. Japan’s long-term indefinite detentions have attracted attention since April last year, when an Indian man who had been held nine months hanged himself in a shower room at the detention center in Ushiku, Ibaraki Prefecture, after his provisional release application was declined. Three other detainees, including a Kurd in his 20s, attempted suicide within a month of that incident, according to Kimiko Tanaka, a Tsukuba, Ibaraki Prefecture-based human rights activist who has been working to support detainees since 1995. 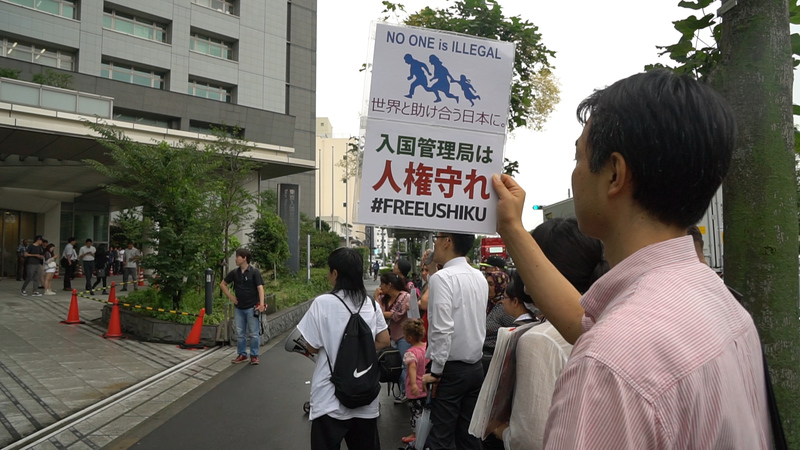 On July 6 last year, Free Ushiku, a citizens’ group organized after the Ushiku detention center suicide, submitted a petition to the government with more than 2,500 signatures calling for Colak’s release, according to group member Wakagi Takahashi. In the more than five months since then, Colak’s wife said she has run out of ways to seek his release. “I’ve talked to lawyers and reporters. I’ve appealed to several politicians and submitted petitions, but nothing has helped. My family has been torn apart,” she said in broken Japanese. Raising three sons between the ages of 7 and 14 by herself in a country where she is not fluent in the language, she has suffered from panic attacks and has been receiving psychiatric treatment for depression. Colak’s detention appears to be affecting their children, too. 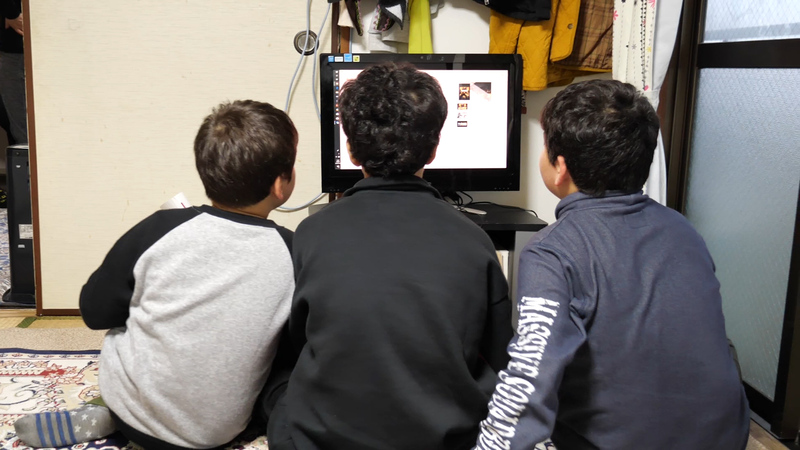 Takako Komuro, who teaches Japanese to Kurds in Kawaguchi, Saitama Prefecture, said Colak’s kids are reluctant to write daily diaries to their mother, which is part of their school assignments, since she can barely read kanji. Colak’s youngest son, aged 7, said he misses his father.